In the past year I have taken a number of sales calls for wood flooring in which I was asked if we provide matching base-shoe and baseboard for our wood flooring. I want to go on the record here and say this is one bad idea I try to steer everyone clear from. There should be a clear delineation where the floor meets the wall. 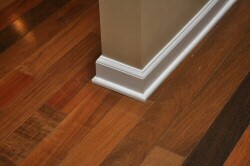 Both baseboard and base-shoe (if needed) should offer a clean visual break from the floor. Why would you want the floor to look like its crawling up the wall anyway? I totally agree about the baseboard being different than the floor but the shoemoulding issue goes either way. The advantage of matching (presumably hardwood) shoe is that it takes abuse from kids, vacuums, etc. better than the softwood painted shoe. Plus when it’s time to repaint the painter (and homeowner) don’t have to worry about paint getting on the floor where it meets the shoemoulding. Doug you are correct from a functional point of view but I have to say the aesthetic consideration in my opinion is more important. I have 3 kids running around and of course baseboards get marred from time to time by the kids but even so I would prefer marred white baseboard and shoe vs. the unclear transition from wall to floor. Use a little blue tape when repainting and the floor should be fine. I don’t disagree with you which is why I said it can go either way – at least in my market in the South. I give the customer the option – explaining the pluses and minuses and let them make an informed decision. This is why we say “beauty is in the eye of the beholder.” Give your customer the option, not your opinion. Being in Real Estate I’ve seen hundreds of homes with wood flooring that have one or the other (some with white and some with stained shoe molding). All I can say is that within the more expensive, custom homes, I have never seen stained shoe molding. Personal opinion here — a home with stained shoe molding screams “quick and easy low maintenance” while white shoe molding screams nothing other than “nice…done right”. So I guess it just depends on how you want your home to feel. 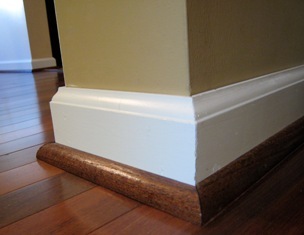 Recently our contractor installed matching stained shoe molding and we very quickly replaced it all with white. It absolutely made SUCH a huge difference in the overall feel of our home with the nice crisp clean lines.